"Never felt like that on a mound before," said McCarthy, whose first four starts were sharp, followed by one bad inning in a four-inning start, then Tuesday's three-run outing. "Coming back, there's a lot of ups and downs, but when the feeling was off, I was able to get through it. Tonight, just the opposite. There were just some horrific, bad pitches in there. I just felt very weird." McCarthy needed 85 pitches to get through three innings. He gave up three hits, walked five, struck out only two and allowed three earned runs. You can listen to Dave Roberts talk about the outing here. BTW, reliever Jesse Chavez did not impress in his first outing as a Dodger. He came in to pitch the sixth inning and gave up three runs. If not for an inning ending double play with the bases loaded it would have been much worse. Fortunately, the slumping Giants couldn't get past the moribund Philadelphia Phillies. They lost to keep the Dodgers two games behind in the division race. This Day in Dodger History: In 1959 the second All-Star Game of the season is played at the LA Memorial Coliseum. The AL defeated the NL, 5-3, on a third inning two-run homer by Yogi Berra off Don Drysdale. In 2013 the Dodgers set a franchise record by winning their 13th consecutive victory. ICYMI: Josh Reddick (#11) and right-handed reliever Jesse Chavez (#58) were activated by the Dodgers yesterday. Rich Hill continues on the DL and will be available to pitch on the August 4th (this Thursday). Of note, Rich Hill becomes the 23rd Dodger to be on the DL this season - setting a National League record. Josh Fields, Ross Stripling and Yasiel Puig were sent to the minors. Via Jon Weisman at Dodger Insider; "Ping Pong 4 Purpose returns August 11 to aid Kershaw’s Challenge." Will Ferrell will co-host the celebrity ping-pong tournament with Kershaw and his wife Ellen. 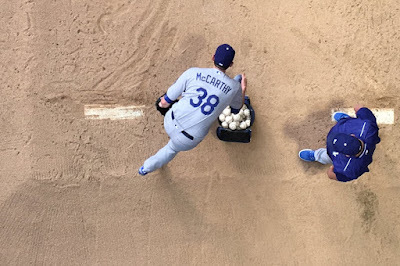 Several folks at Baseball Prospectus take an in-depth look at the flurry of trades involving the Dodgers. Go here to check out what they had to say. Via Jon Heyman at Todays Knuckleball; "It wasn’t just his play; Puig’s demeanor contributed to his demotion." If Puig’s time with the Dodgers can be salvaged it will clearly require a commitment on his part to become more professional in his preparation and work ethic. “We can all continue to grow. But – Yasiel can continue to grow. I’ll leave it at that,” Roberts said. “I mean, there’s definitely been good moments of quality work. But that needs to continue to be consistent. Via Dylan Hernandez at the LA Times; "Yasiel Puig's time with Los Angeles Dodgers always seemed destined to end badly." But the Dodgers also are responsible for Puig’s descent into mediocrity. The organization never figured out how to handle him, never finding the right balance between Don Mattingly’s no-nonsense approach and Dave Roberts’ love-him-to-death form of diplomacy. Dylan also reminds us of Puig's former minder, Tim Bravo. He was a constant companion of Puig's during his first season, and might have been the only person capable of watching over the guy. Via the Great Lakes Loons at MiLB; "Loons, Dodgers Agree to Partnership Extension: Player development contract with the L.A. club runs through 2018." "Our relationship with the Great Lakes Loons and the Great Lakes Bay Region has blossomed beautifully in 2016," Dodgers Director of Player Development Gabe Kapler said. "We feel lucky to be in a partnership with the Michigan Baseball Foundation, Bill Stavropoulos, Paul Barbeau and Scott Litle. We're thrilled to continue our relationship with the organization for two more years."